Ancient stone farmhouse of the 1700 restored with conservative criteria that has left intact the charm and beauty of the past. Located between the Val d'Orcia and the Sienese Chianti hills, the farmhouse is divided on two floors: the first floor is accessed by an ancient stone staircase and a small loggia that opens onto a large Tuscan dining room with a large fireplace, three large bedrooms and two bathrooms. On the ground floor a living room with stone floors that houses the living room, an equipped and professional kitchen with dishwasher, fridge, built-in barbecue and a full bathroom. Upon reservation, cooking classes, tastings of the best Sienese wines and dinners with typical Tuscan flavors are held; the farmhouse, furnished with style and elegance, preserves the ancient terracotta floors and ceilings with wooden beams and is attached to an estate of seven hectares of land and forest, surrounded by a large private garden with swimming pool, sun terrace with sand river, and a small lake. Nice farmhouse and outbuilding dating back to 17th century which have been tastefully restored preserving the ancient charm and the terracotta-tiled floors. 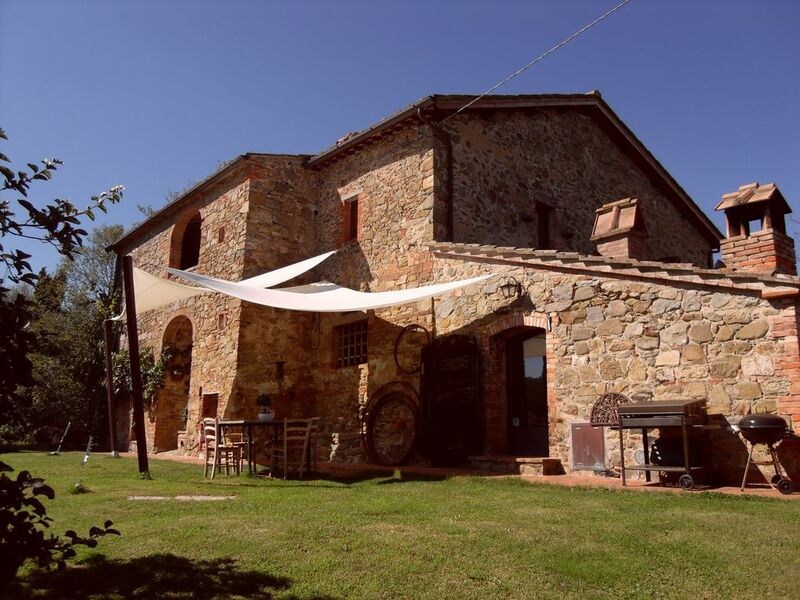 Located between the Val d'Orcia and the hills of the Sienese Chianti, the farmhouse is on two floors: the first floor is accessed by an ancient stone staircase bedrooms and two bathrooms. On the ground floor there is a kitchen, fridge, fireplace and brick barbecue. On request possibility of cooking courses, tastings of the best Sienese wines and typical Tuscan dinners. The farmhouse, furnished with wood and furniture, surrounded by a large private garden with swimming pool, sun deck with river sand, and small pond. Val di Chiana and Val d'Orcia with its wonderful medieval towns such as Cortona, Montepulciano, San Quirico d'Orcia, Pienza, as well as Montalcino and San Gimignano and the beautiful art towns of Siena, Florence and Arezzo. An ideal place for a holiday or for a walk in the woods.